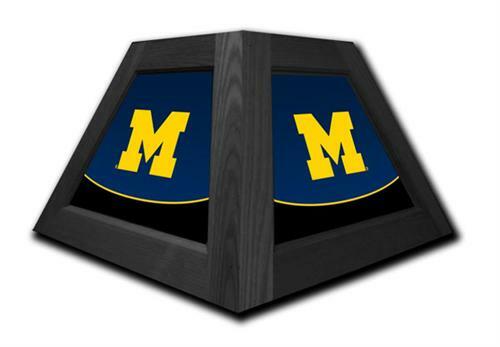 Show your school spirit with a Michigan Wolverines 17" Pendant Lamp over a poker table, favorite chair, or to accompany one of our 42" billiard table lights! The frame is handcrafted using tongue and groove joinery, with side and end panels boasting vibrant backlit graphics printed on shatter resistant Duratrans acrylic. This single bulb fixture is capable of producing up to 100 watts of illumination using a compact florescent bulb (not included), or up to 65 watts using an incandescent (not included). Ceiling canopies and chain are included, allowing for easy installation.